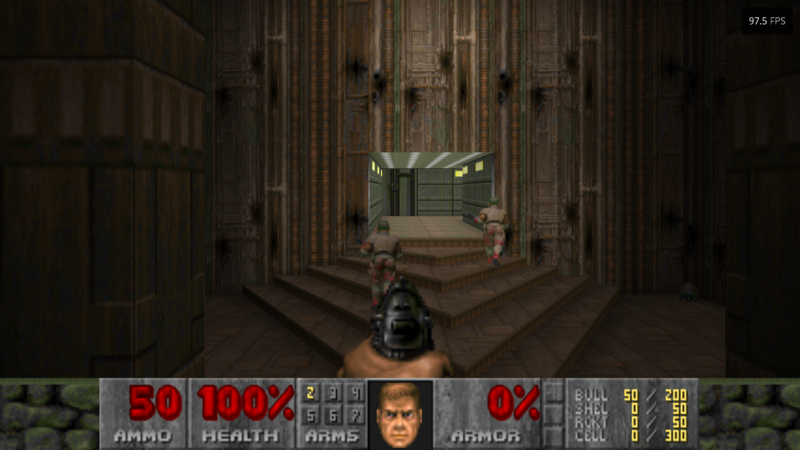 The default field of view in a lot of Doom source ports is around 90. This is true for Doomsday Engine as well but it doesn't seem to be the case in game. The screenshots below show the field of view in Doomsday Engine versus another popular source port, both of which have it set to 90. The FOV in Doomsday is much more limited - it seems to be way more zoomed in and not as wide. This also results in some game play changes, notably the bobbing being much greater in Doomsday when the FOV is at 90. In order to get a comparable FOV, I have to set it to about 140 but this results in a serious performance degradation in some maps. It would be nice if the FOV settings in Doomsday matched those of other source ports but then of course the problem of performance becomes an issue. I know that Doomsday has a lot of visual enhancements over other engines but I don't think that it should cause so much of an issue, although that should probably be discussed separately. Strange. If I run the original Doom2.exe via Dos Box and Doomsday side by side, they look the same. Chocolate Doom and Prboom looks the same also. But pretty much all other source engines look a little different/taller aspect. Although the FOV looks right. I have Doomsday set at 90 FOV btw. !check and make sure your video resolution is at most 640x480, run in window mode and manually resize the window to be the same as the source port you're comparing to. Also make sure of the status bar, if it's not shown, it changes a bit of the aspect in all source ports as well as Doom2.exe its self. It also looks like you're standing in a different place in each of those screenshots. I believe the difference is coming from the handling of widescreen display modes. 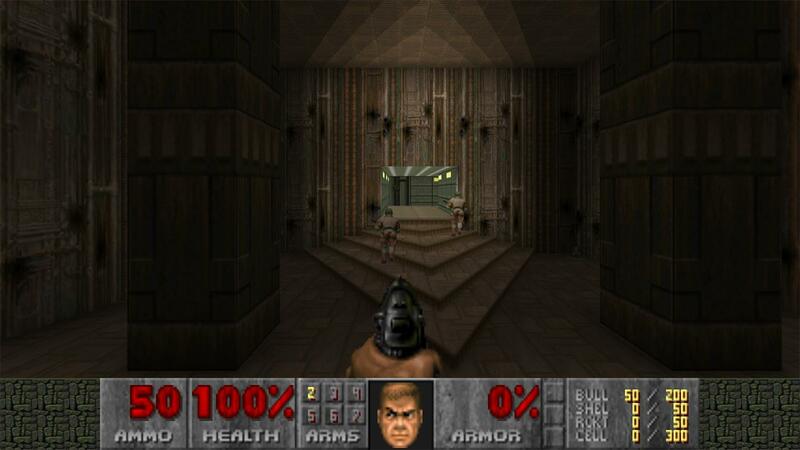 The original DOOM only had to deal with a 4:3 VGA screen. IMO, if you keep that vertical FOV and just stretch the horizontal display area, the horizontal FOV is way too wide (like in that second screenshot). That is why Doomsday interprets the FOV parameter a bit differently, which results in a narrower field of view on widescreen. A good FOV for you is actually quite subjective, since it also depends on your monitor size, viewing distance, and personal preferences. The original DOOM only had to deal with a 4:3 VGA screen. IMO, if you keep that vertical FOV and just stretch the horizontal display area, the horizontal FOV is way too wide (like in that second screenshot). That is why Doomsday interprets the FOV parameter a bit differently, which results in a narrower field of view on widescreen. However, the standard for modern games is, that widescreen is handled as it is shown in the 2nd picture. So the "confusion" is understandable. Maybe make a setting so the user can decide how widescreen is handled? Because I personally would prefer it as it is handled in other ports/modern games. I understand now and I agree with Milten's suggestion - it would make sense if there was an option to handle widescreen support in a similar fashion to other engines. Yes it's true that the horizontal FOV will appear quite wide if the vertical FOV is preserved but I think that's preferable to the current options. Players will still have the option of playing at a 4:3 aspect ratio if they want a proper vanilla experience in terms of FOV. The current method of preserving the horizontal FOV at the expense of vertical viewing area is pretty questionable. However, if handling FOV similarly to other engines will result in a performance degradation similarly to increasing the FOV after setting a widescreen resolution, then just ignore this idea. The default FOV setting of the current Doomsday v2.03/2.1 builds is "95". It used to be "90" in the old v1.8x/1.9x builds. One of the issues when playing on widescreen with the default FOV is that it feels like you're playing in slow motion since it feels zoomed in. Setting it to 137 pretty much matched it to other source ports.